Is Not Already Selected — This option allows new selections to be partially based on the results of previous selections. If this option is chosen, only records that were not matched in the previous selection will be identified as a match in this selection. Is a Data Record — Any raw data record (not a summary record) will be identified as a match. 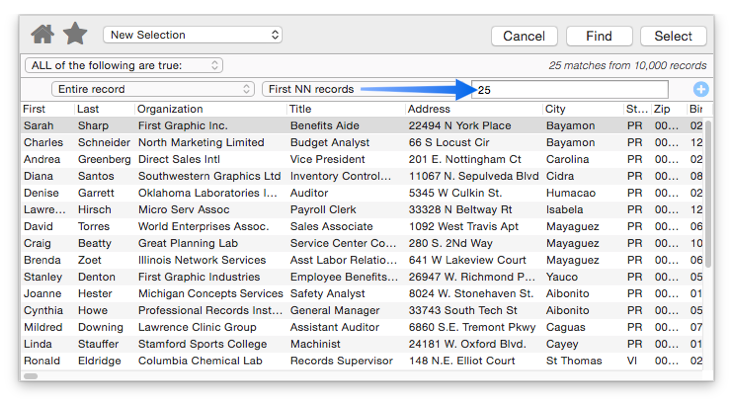 First NN records — This option allows you to select the first few records in the database. In this example the first 25 records in the database will be selected. 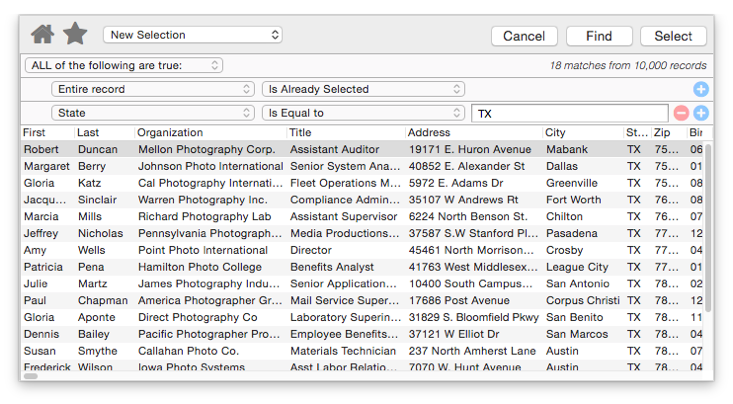 Last NN records — This option allows you to select the last few records in the database. Every other record (1, 3, 5…) — This option allows you to select half of the records in the database. Every other record is selected, starting with the first record. Every other record (2, 4, 6…) — This option allows you to select half of the records in the database. Every other record is selected, starting with the second record. Every 3rd record (1, 4, 7…) — This option allows you to select one third of the records in the database. Every third record is selected, starting with the first record. Every 3rd record (2, 5, 8…) — This option allows you to select one third of the records in the database. Every third record is selected, starting with the second record. Every 3rd record (3, 6, 9…) — This option allows you to select one third of the records in the database. Every third record is selected, starting with the third record.